I first encountered Chiharu Shiota’s dramatic artwork at the 2001 Yokohama International Triennale of Contemporary Art. Her Memory of Skin comprised a row of five muddy-brown dresses suspended from the high ceiling, each dress 13 metres tall and with a water pipe above it pouring cleansing water down its length. Standing at the foot of these dripping dresses that towered over the exhibition was a humbling and unnerving experience and it has haunted me since. So it was with great interest that I explored Embodied, the survey of her work shown at the Art Gallery of South Australia in this year’s OzAsia Festival. The survey, including a newly commissioned installation, forms the centrepiece of OzAsia’s visual art program, exploring the 24 years since her seminal performance piece Becoming Painting — made in Canberra in 1994 — in which she wrapped herself in canvas and was splattered with red paint. The AGSA has documented her career with a substantial publication, Chiharu Shiota: Embodied, which contains insightful essays by AGSA curators Russell Kelty and Leigh Robb and independent curator Anais Lellouche, together with an interview with the artist. The book, bound with red string to echo Shiota’s use of such material, includes an image of Memory of Skin and other early work including drawings and video stills. 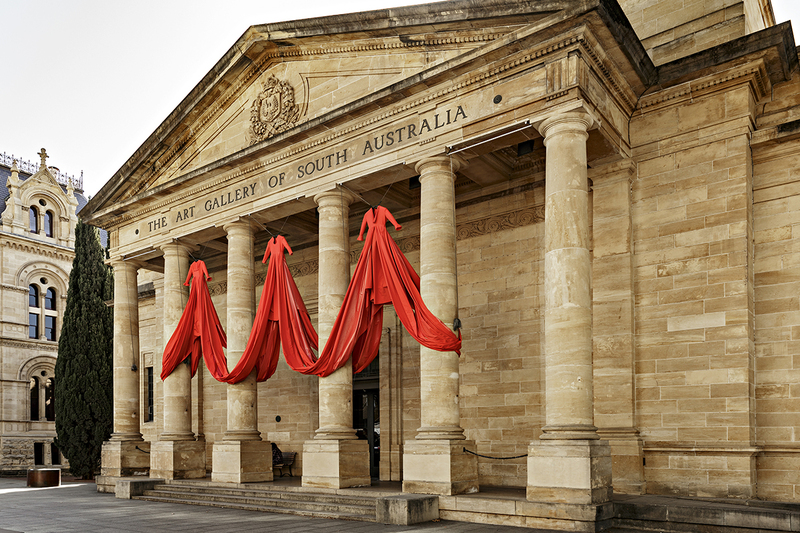 A new work, entitled Internal, accompanies the AGSA survey — an array of three, six-metre long red dresses draped across the pillars of the AGSA’s neo-classical façade, again dwarfing the viewer and offering an irresistible taste of the extraordinary work within. Chiharu Shiota was born in Japan and studied art there but reconsidered her work following subsequent study at the ANU School of Art in the early 1990s, moving away from traditional forms of painting with which she had become disillusioned and into the field of performance and installation. Based in Berlin since then, her oeuvre has expanded over the years to encompass video and more recently bronze casting. The most overwhelming work at the AGSA is her Absence Embodied, a site-specific installation commissioned by the gallery and occupying an entire room, comprising a dense web woven from 180 metres of red woollen thread suspended from the ceiling and walls. The web is anchored to the floor by castings of body parts of the artists herself and family members including a bronze of three hands — her daughter’s, her partner’s and her own — clasped together and entitled Belonging (2017). She had been invited to make a work responding to the AGSA collection and, as that room is normally hung predominantly with figurative paintings, her intention with Absence Embodied was to evoke the absent figure. 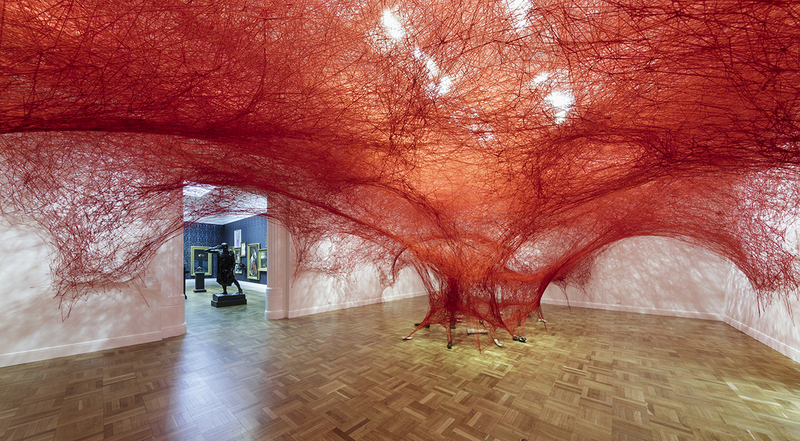 Shiota indicates that her string installations, which she first developed in Canberra, are a form of drawing in space and the colour red, which she uses frequently, suggests blood vessels. Absence Embodied envelops the viewer, creating the feeling of being inside Shiota’s circulatory system, the castings of limbs marking the extremities of her body; suggesting to me a body being torn apart. Shiota is one of five female artists in OzAsia 2018 who originate from Asian countries and who consider the self and especially the body in widely divergent ways. 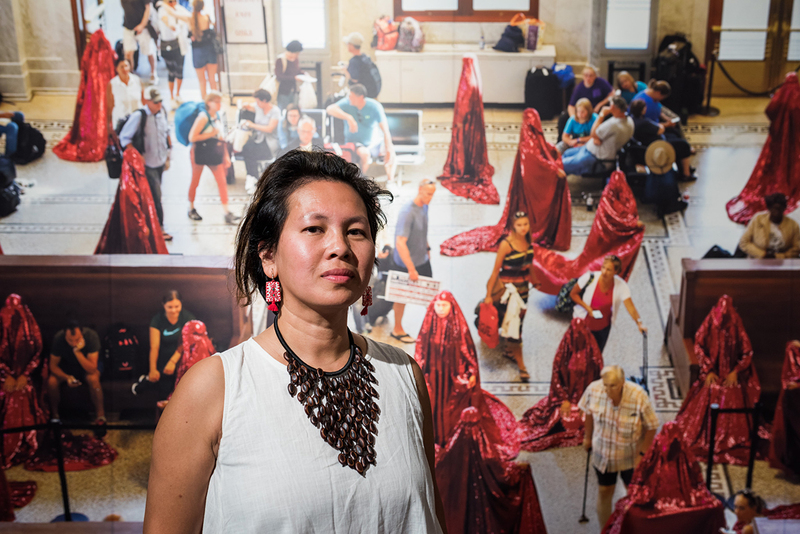 Cambodian-American artist Anida Yoeu Ali’s The Red Chador: in Memoriam is an ongoing activist performance that has evolved since its inception in 2015. Ali created the Red Chador — a full-length chador covered in red sequins and sometimes masking her face — for public performances, drawing attention to the anxieties that the Islamic religion and dress codes provoke in the west. The chador’s colouring and the use of sequins are inconsistent with typical Islamic dress, distinguishing the artist’s appearance from that of other Muslim women and offering a conceptual challenge to curious onlookers. Over the course of Ali’s performances, the Red Chador has become a character, the personification of a refugee or a victim of authoritarianism or racism — a creation intended to mobilise opinion. She has enacted numerous performances around the world in which she appears silently in public wearing the chador. Having originated in Paris after the Charlie Hebdo incident, the Red Chador was well-received there but provoked often very negative responses in the US — in one instance, Ali had to abandon the performance, such were the threats to her safety. and invited audience participation by making offerings of incense. Presumably Ali could make a new garment but instead has used the Red Chador’s mysterious disappearance, equating to the abduction of a person, as an extension of the original concept, now evidencing an attack on free speech. South Korean artist JeeYoung Lee exhibited a series of large-scale images that take tableau photography into new territory. She creates imaginary scenes and then photographs herself within them, her scenes suggesting bad dreams in which the dreamer is lost in a strange world and faces imponderable conundrums or existential threats. In My Chemical Romance (2013) she is seen trying to find her way through a forbidding maze of steaming water pipes painted in the black and yellow colours of construction-site barriers, as if she is lost in an industrial plant. In Resurrection (2011), she sits inside a flower in a pond looking like a newborn water sprite, the image suggesting she has escaped civilisation and returned to nature. In Gamer (2011). a male figure is dwarfed by oversized Lego bricks with which he is building a structure, suggesting that he is the artist’s online avatar, creating his own world. While her work may appear whimsical, it offers metaphors for the difficulties of contemporary life. 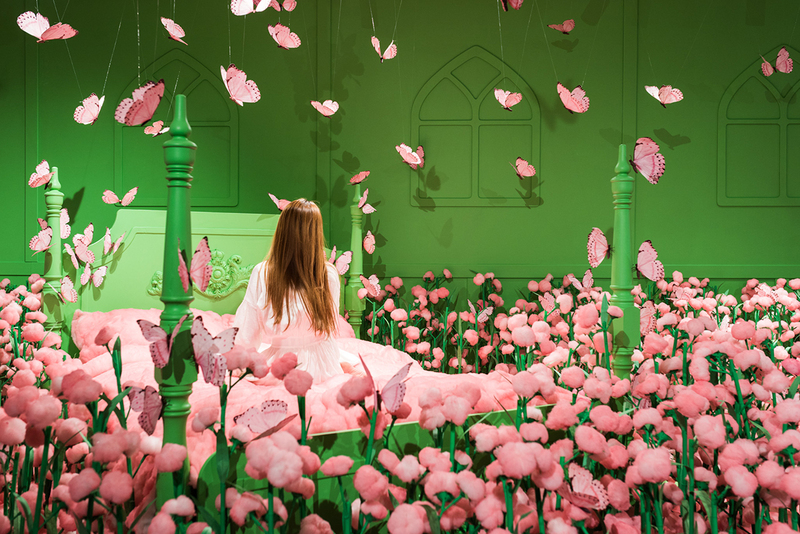 Positioned opposite the display of JeeYoung’s photos is an installation — a double bed in a field of pink cotton-ball flowers above which hover artificial butterflies — that resembles the kinds of scenes created for the photos. The empty bed invites us to imagine occupying this fantasy space and her other spaces and to reconsider the world we have created for ourselves. 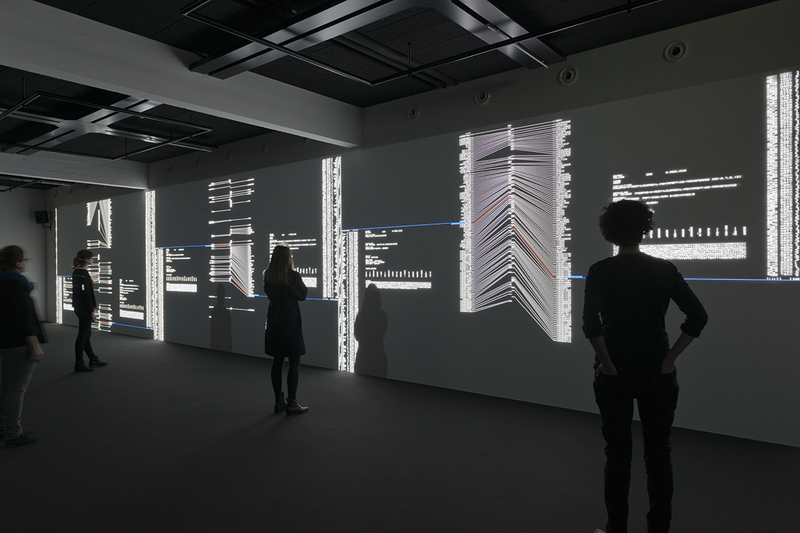 The titles of JeeYoung’s works are crucial to their appreciation and unfortunately the Festival Centre did not provide a caption or plaque indicating the title of each work, obliging interested viewers to search for the works online to discover their titles. Some of Kawita Vatanajyankur’s videos were also shown at indoor and outdoor locations around the Festival Centre, extending their public visibility, but they too were uncaptioned and were screened alternately with material publicising other events, risking their significance being lost on passers-by. Kuala Lumpur-based Yee I-Lann’s Like the Banana Tree at the Gate (2016) is a photo-collage showing a row of standing and seated women in various poses, some holding banana palm leaves and all with their faces obscured by very long hair. Some figures appear more than once as if they are doubles or multiples of the same individual. Yee’s work references traditional folklore to create a general metaphor for female power and more specifically for feminist movements in Malaysia and elsewhere in Southeast Asia. The catalogue essay informs us that these female figures each represent a Pontianak, a female spirit of Yee’s native Borneo that inhabits banana trees, and that the work’s title refers to “a 17th century sultan in southern Borneo who advised his subjects not to plant a banana tree near their front gates so as not to advertise their wealth to potential colonial exploiters,” the story have since been cited as an early form of resistance to colonisation. The figures in the photo-collage are in western-style casual dress to which viewers can easily relate and suggests that these female spirits are ubiquitous. Collectively they can be seen as a defensive force guarding traditional Bornean culture and sovereignty. The female artists selected for this component of OzAsia all have major international reputations and showing them together enables illuminating comparisons, with a primary focus on performance and on the female body as a site of self-understanding and self-realisation. Shiota’s cathartic 1994 performance Becoming Painting was a turning point for her and resonates with the meditative performance work of Kawita Vtanajyakur, which involves risk-taking as a pathway to personal transformation. Anida Yoeu Ali’s daring public performances involve risk-taking as a means of encouraging social transformation. JeeYoung Lee’s performances in her imaginary spaces may be less risky physically or politically but equally encourage viewers to consider the controlling forces of their own worlds. The OzAsia Visual art program also included two very different exhibitions providing notable contrasts to the work of the five female artists — Edo Style: 1615-1868, an exhibition of Japanese art of an era that provides a window to a long-lost, isolationist culture in which social customs and women’s roles were very different from those of today’s Japan; and renowned Japanese artist Ryoji Ikeda’s visually overwhelming and highly cerebral video and sound installation data:tron [3K version], which presents at hypnotic speed a seemingly infinite amount of numerical data, as if everything in the universe is ultimately reducible to numerals, codes or mathematical formulae. The inclusion of these exhibitions creates a sense of historical development, showing where we have come from and where we might be headed. While the OzAsia visual art program has no overarching theme and sensibly does not attempt the impossible task of surveying the art of the Asian region each year, it does highlight its breadth and depth, and in this program, it especially highlights the concern of women artists with female identity and empowerment and the evolving roles of women in increasingly globalised cultures. OzAsia reveals this cultural and political evolution through the inclusion of exemplary exhibitions by leading contemporary artists.